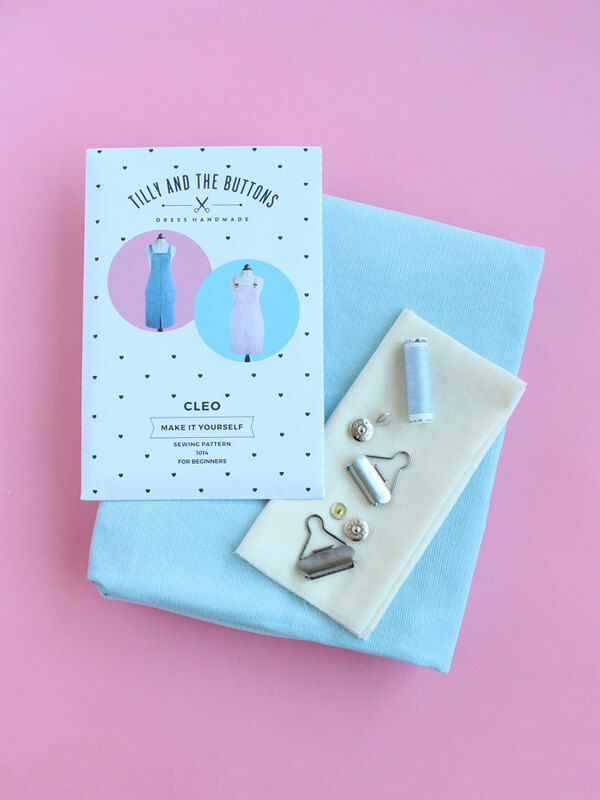 Tilly and the Buttons: Introducing the Cleo Sewing Pattern! Get excited – it’s here! 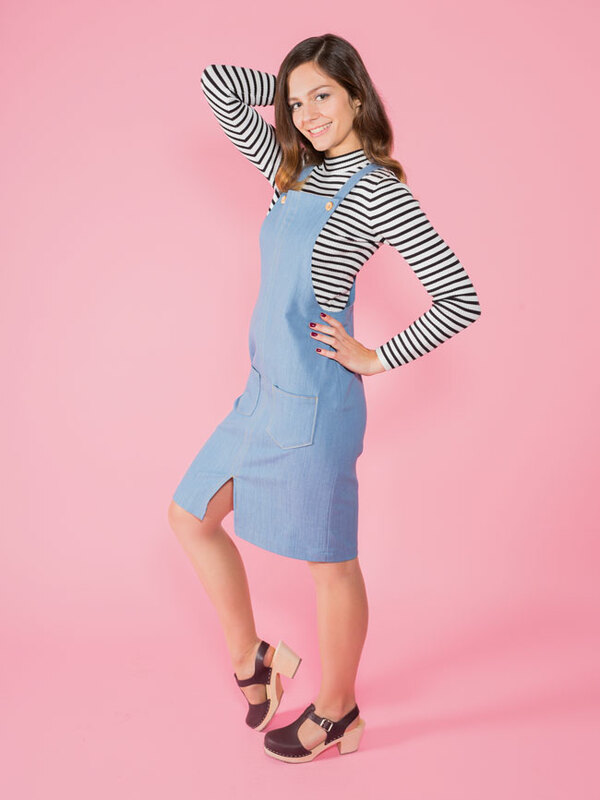 Our new sewing pattern is the super cute and utterly wearable Cleo pinafore or dungaree dress (AKA jumper or overall dress)! Cleo is speedy to sew and easy to wear – I hope you love it as much as we do. Aaaaaand for the very first time, we’re offering sewing kits with everything you need to make it! 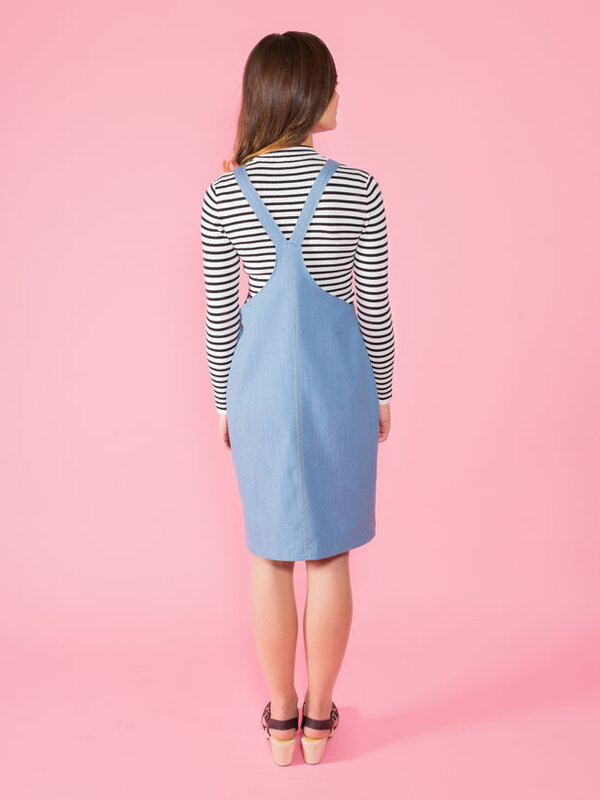 If you haven’t worn a pinafore like this before, you’re in for a treat. It’s sooooo comfortable, you’ll want to wear it all the time! Layer Cleo over a snuggly sweater or turtleneck and knitted tights when it’s cold, or over a shirt or t-shirt when it’s warm. Cleo is one of those projects that’s refreshingly quick and easy to make – so it’s great for beginners as well as more confident stitchers looking for a speedy project. It has no fiddly zips – just throw it over your head! – and the casual style means minimal fitting is required. 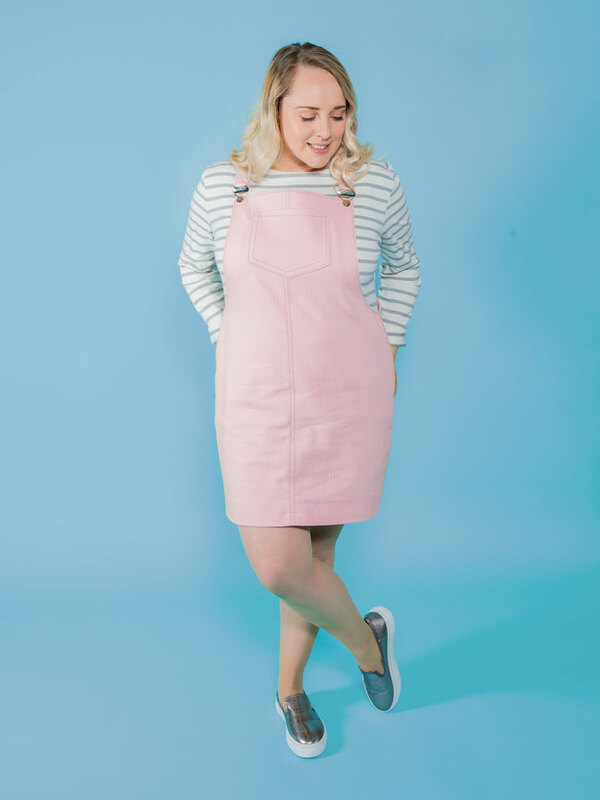 But it still looks impressive – every time I’ve worn one of my (many) Cleo pinafores, someone has commented on how it looks difficult to sew… but it’s honestly one of our easiest sewing patterns. Hooray! 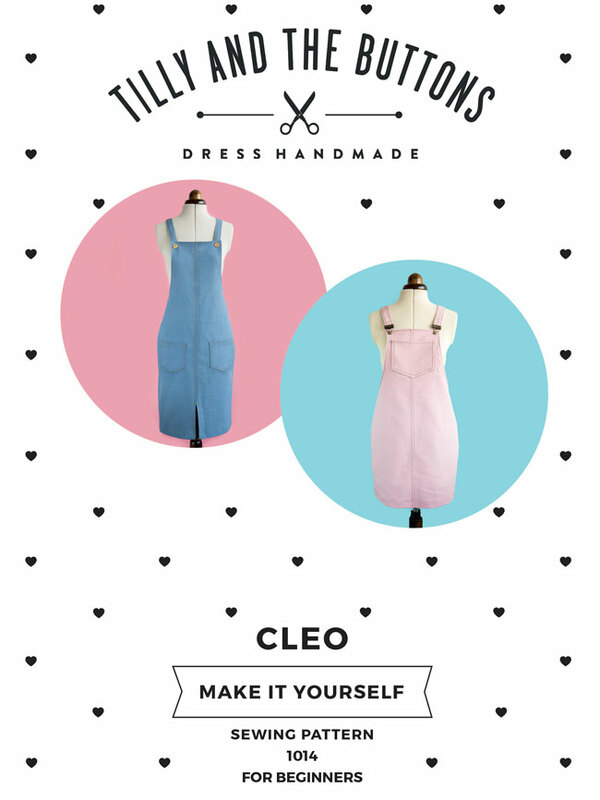 We've put together Cleo sewing kits so it's simple for you to get your hands on the bits and bobs you need to make it. 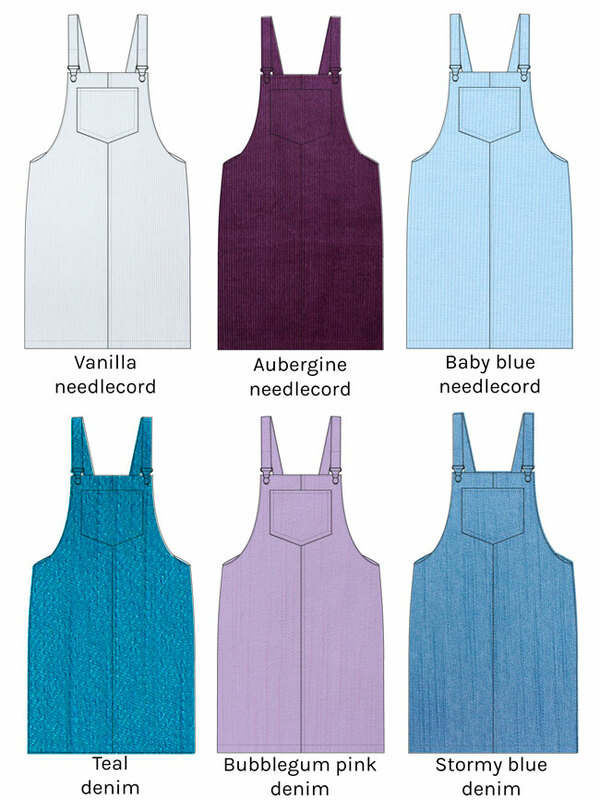 We’ve sourced lurrrvely quality needlecord and denim (with just a teeny bit of stretch) in delicious colours, and great quality dungaree buckles and no-sew buttons that are really easy to attach – just press them on with your fingers! Just to warn you, we have a limited number of each kit – if you love one of the colours, grab it now! 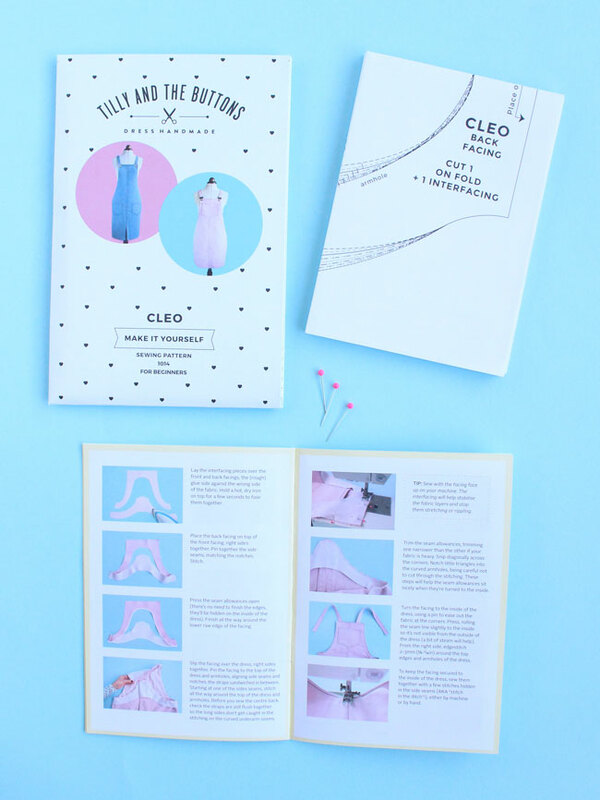 Like all Tilly and the Buttons patterns, Cleo includes super clear instructions with photos of each step so you can see what it’s supposed to look like as you’re making it. Prefer to print and assemble your pattern at home? 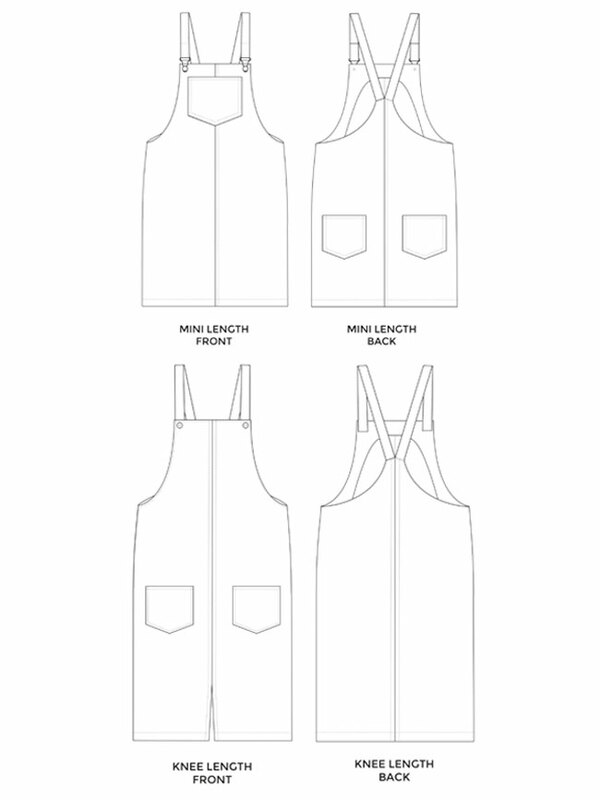 Order the digital pattern and you’ll get an email in an instant with a PDF to download. If you want to choose your own fabric, go for a medium- to heavy-weight woven material that holds its shape, such as denim, corduroy, cotton drill, gabardine, canvas or wool. One of our testers even made it in a ponte and it turned out lovely! 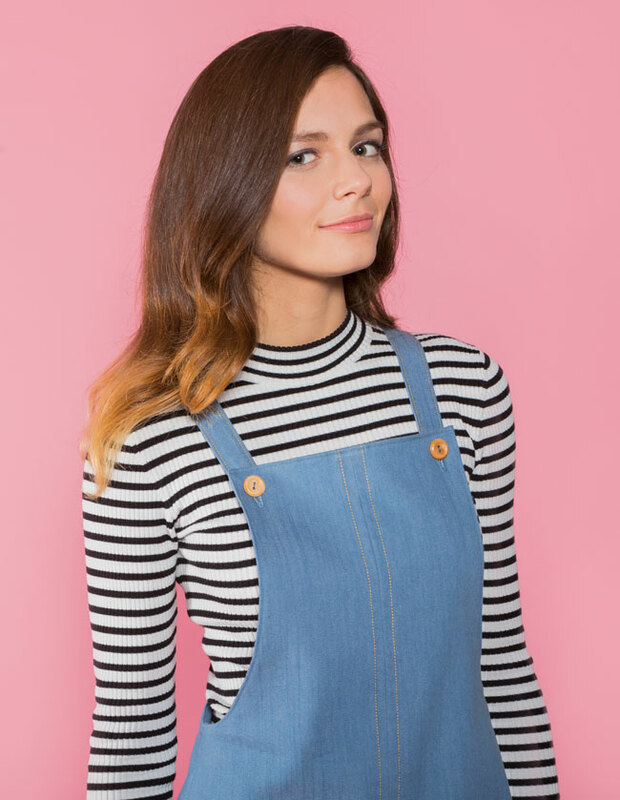 If you want to make it dungaree-style (overall-style), you’ll need two 30-35mm (1¼in - 1½in) dungaree buckles and two no-sew jeans buttons. We've sourced some great buckles with no-sew buttons that are really easy to attach - just press them on with your fingers, no tools required. Alternatively you can make it pinafore-style with two 15-20mm (5/8in - 7/8in) buttons. 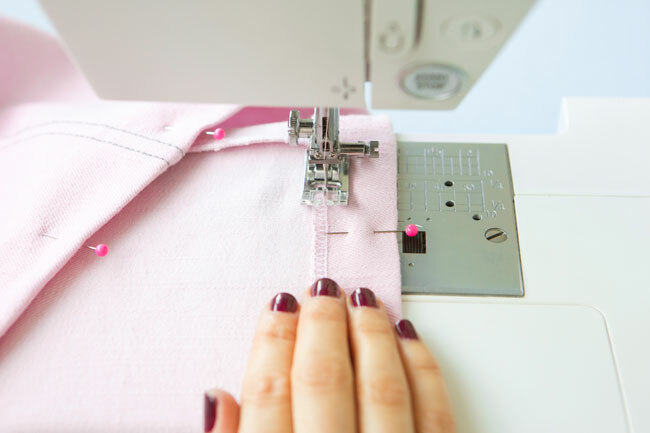 You’ll also need matching thread, interfacing and optional contrast topstitching thread. 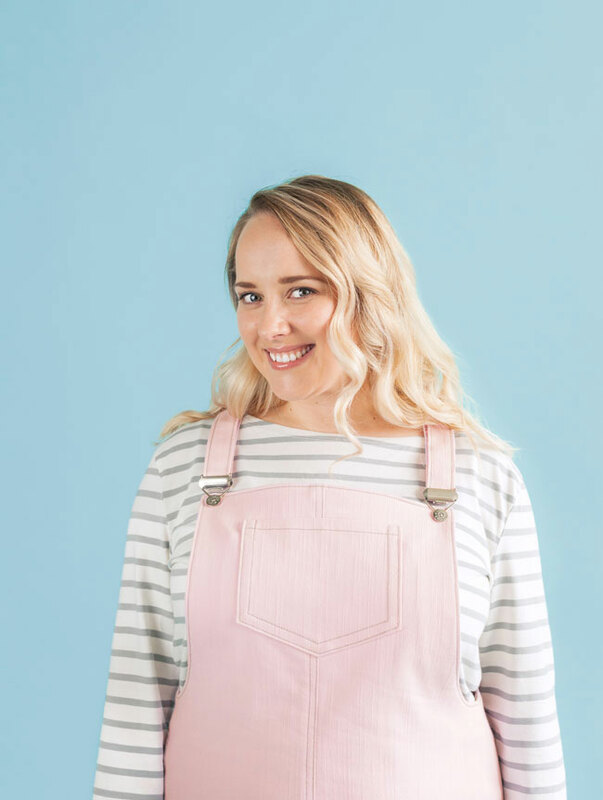 And finally, if you fancy some teacher guidance to make your first Cleo dungaree dress, come to our brand new workshop at our London studio! 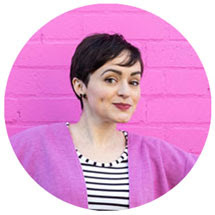 On Saturday 3 December 2016, the lovely Hannah from The New Craft House will take you through all the steps to make it, from choosing your size and cutting out fabric, to creating a neat finish. 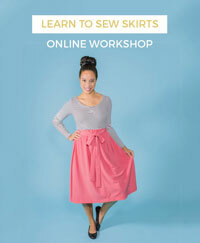 This is a great sewing class for beginners who've made a couple of simple projects before and want to get into making clothes. It'll be fun! Book your place now. I really hope you enjoy making Cleo as much as I do. 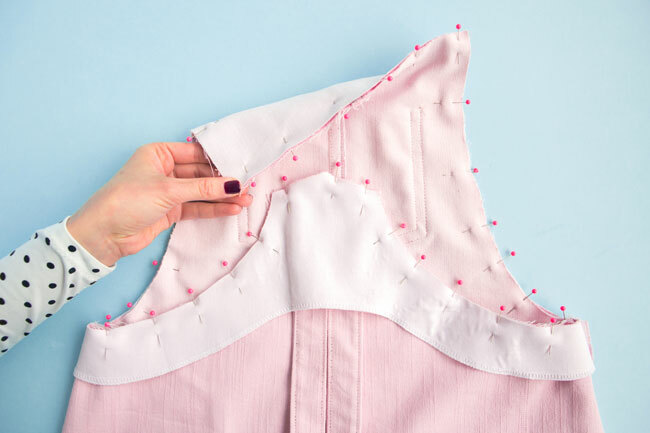 We always love to see what you’re making, so share your work-in-progress and finished creations on Instagram – tag us @TillyButtons using the hashtag #SewingCleo so we don’t miss it.